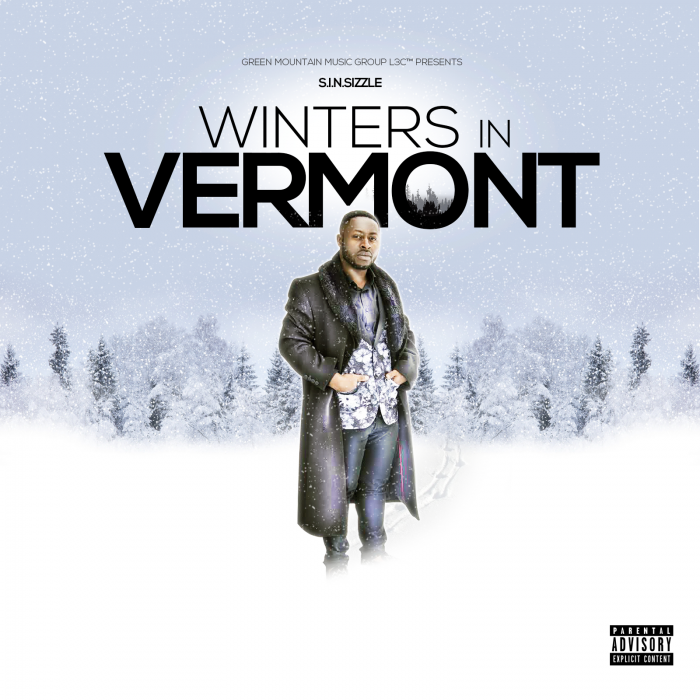 Green Mountain Music Group L3C ™ is proud to present the release of “Winters In Vermont” the new hip-hop project by S.I.N.siZZle. With the release of the first single and video “Never Scared”, fans and newcomers alike have been keen to hear to the material. The video was shot in scenic Stowe, Vermont and showcases the landscape and winter wonderland in 4K detail. Winters In Vermont is a culmination of 6 months work that S.I.N. has decided to put together as a representation of his art. It is also his debut project released through our imprint and we couldn’t be happier to have him. S.I.N. has been a mainstay on the Vermont music scene for over a decade. He’s played venues like Higher Ground, Nectar’s The Flynn, and WCAX Channel 3’s “Set The Stage” program to name a few. A seasoned performer, he’s shared the stage with a host of artists ranging from Wyclef Jean to Ledisi and local all-stars like Dave Grippo Funk Band and the VT Union. Winters In Vermont is a hip-hop album but certainly has pop influences with records like Hands of Time and Rock Out. This particular project centers on him getting his voice back after years of working with other artists and creating a business model that was sustainable for his own career. Winters In Vermont is a unique listening experience from a relative unknown (outside of Vermont). An enjoyable, witty, fun yet storied ride that will keep the listener attached to the music and engaged in the journey. But with a total playtime of less than thirty minutes it doesn’t drag or leave anything to be missed. Recorded and mixed by Skysplitter Ink, this release is finely engineered for your listening experience. Please find the link(s) and contact information below for further information. © 2017, @BWyche. All rights reserved.